This 2 story log home is right on the cove water of Log Country Cove resort . Entering the cabin will take you to the kitchen. A small bath will be on your left. The small kitchen offers a microwave, dishwasher, refrigerator and cook stove. The private bedroom off the kitchen has a double bed. The kitchen bar overlooks the compact dining and living areas. Large picture windows give you great views of the K-Bar lawn area and cove water. A winding spiral staircase leads you to additional sleeping quarters. With a very low ceiling this may be the place to put children. This area offers a queen bed, futon and small table making it a great place to play board games or cards. Going up the wood stair case puts you in the loft bedroom complete with king bed and private bath. You will want to treat yourself to total relaxation in the jacuzzi tub. Indoor amenities include a propane fireplace, TV's, Dish Network, wireless internet and a DVD player. The massive wood deck lets you rock your troubles away as you look out over the grounds to the water. You can fish from the bank if you bring your gear and fishing license (required for ages 17 and older). You can even build a fire in the open grill for roasting marshmallows or hot dogs. Sitting around the fire as you watch the kids and grown-ups chase the fire flies. Young children can enjoy the small playscape located opposite the lake side of the home. The K-Bar is close to commons area that is filled with all kinds of fun things to do. Memorial Day weekend sees the water trampoline being place in the lake once again. One of the most popular features is the rope swing. Upper body strength is the key to a great landing in the marked off swimming area of Lake LBJ. Playing putt putt golf is a wonderful way to get everyone in the group involved. Water toys (tubes, skis, knee boards) and watercraft (both motorized and non-motorized) are available for rent. You might want to go skiing or be pulled behind a boat in one of the tubes; you choose the size you need. Kayaking or canoeing in the cove is a great way to spend an hour or so. 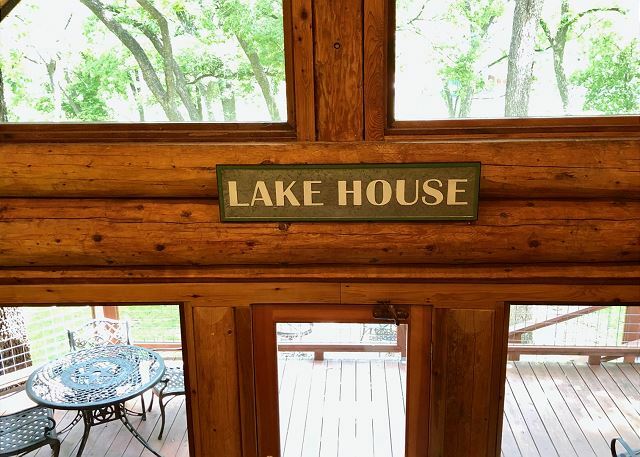 A trip up the lake allows you to see the many beautiful homes on Lake LBJ. If you want to relax and float around, but not in water too deep the little sandy beach is the place to be. This is near the Sunset Pier where you will witness a beautiful Hill Country sunset if evening finds you in the area. Many of our large log homes are situated on 5 acres and surrounded by undeveloped land. Hiking on the Sarayu Trail gives you an opportunity to catch a glimpse of some of the homes. You will also be treated to Mother Natures' beauty as you walk along the path. You might spot a rabbit or even a baby deer if you travel quietly. Regardless of the season, nature provides a variety of things to see. This is a 2 1/2 mile trail one way. For the less energetic there are several places you can hop and off making the stroll less grueling. K-Bar offers great accommodations for up to 8 guests. The outdoor grounds offer plenty to keep you occupied and you are only about 100 yards from the common area. Once you get here you won't want to leave. Many make it a family tradition to spend time at this lovely cabin. Love visiting LCC. It’s a great place for a little getaway with just a few people or a big group they can accommodate it all. This home was amazing didn't use all 3 rooms only 1 but it's a great place if your planning something for a family get togethor. Enjoyed our experience; peaceful, scenic. Wish owners would add clothing hooks - both the overdo hooks and wall horseshoe hooks (had 1 of each) since there are no closets. Also wish owners would add club chair in living room; needs more, comfortable seating. Avis, we are so glad that you enjoyed your stay in the KBar. We hope to have you and your family back with us in the future. I will be happy to relay your concerns for cabin to the owner. The kbar was perfect for two older couples to enjoy the peaseful setting, cook, eat, play cards and just relax. 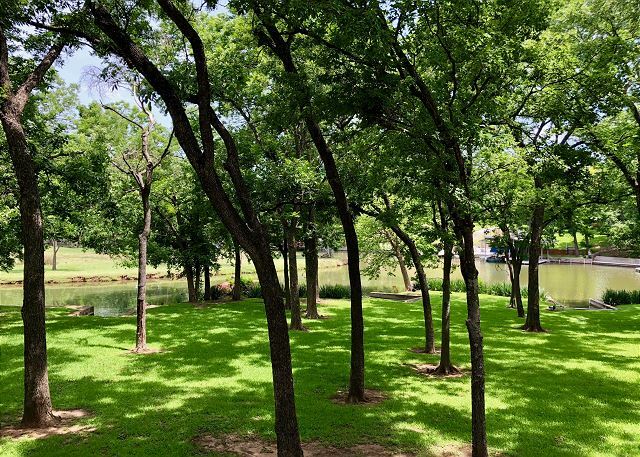 We were very impressed with the grooming of the grounds just a short time after a devastating flood just weeks before our stay. The Legends Golf Course just up the road was also in excellent condition.